The music room makeover is plugging along nicely! I'm really enjoying making over this room. Because it's a slow process, we have the opportunity to make all of our decisions carefully, thoughtfully, and right the first time. I'm really liking my new desk (more on that in the total room reveal), but the wall space above it needed something. 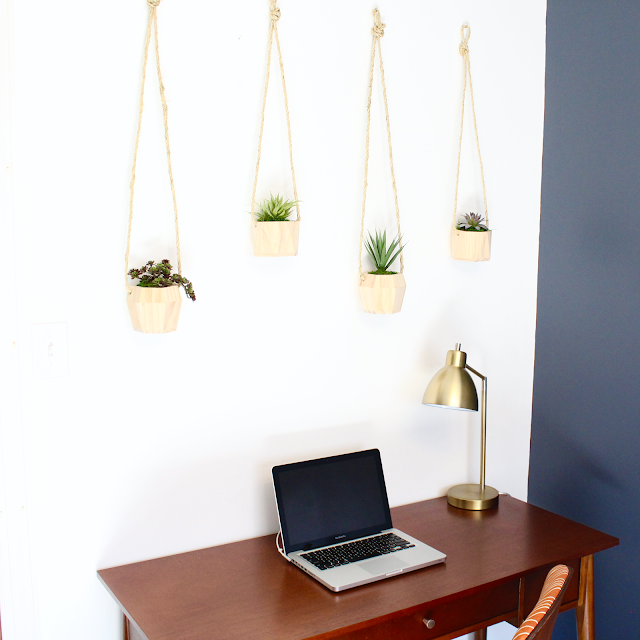 Sarah and I wanted some small pops of color on the only white wall in the room, and thought some wooden plant hangers would do the trick. 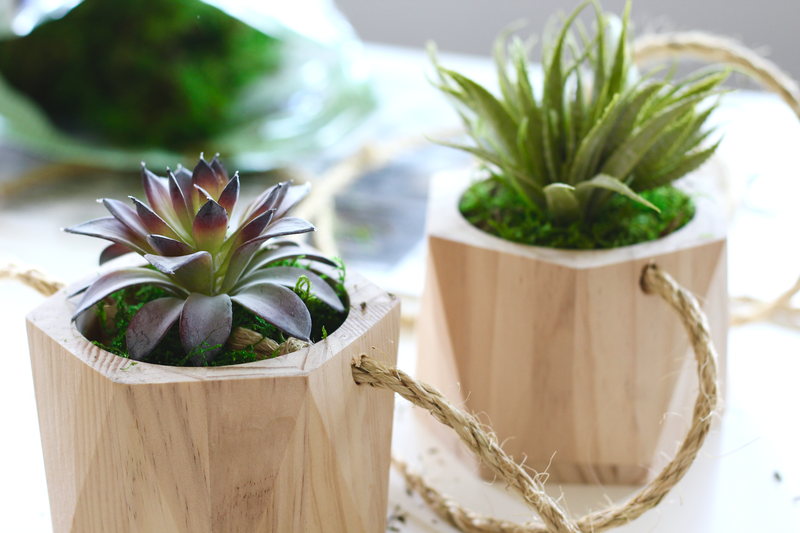 These awesome wooden planters from Target are unfinished wood, so they're perfectly customizable. You could paint them, or finish them with some polyurethane, but I really like the raw wood look against some of the darker elements in the room. If you like this look, here's how we did it! Since our planters are hanging above a desk/computer, we wanted to avoid using real plants we would have to water, and provide adequate drainage for. 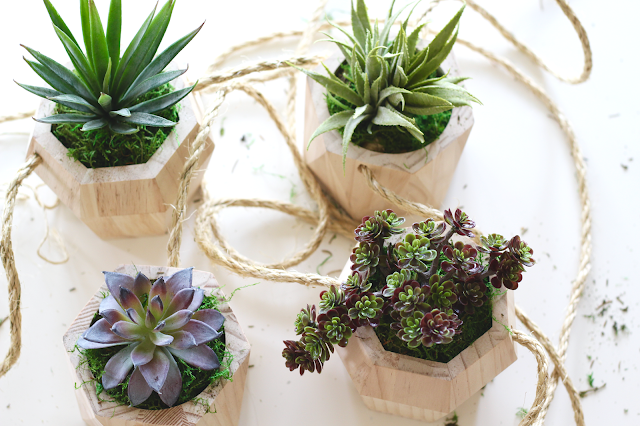 We decided to use faux plants and found these great looking faux options at our local JoAnn store. Could you tell they were fakes?! 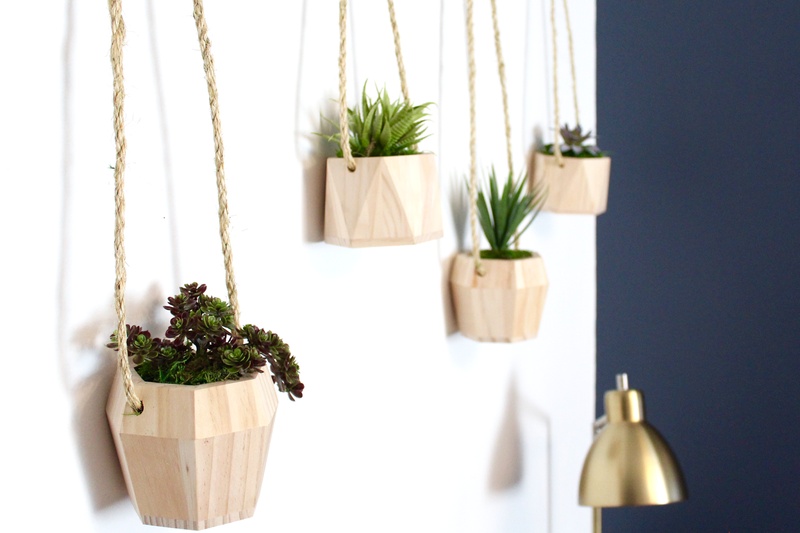 - Decide where you want the planters to hang, and screw your cup hooks into your wall. - Measure your desired length from the hook to where you want the planter to hang. 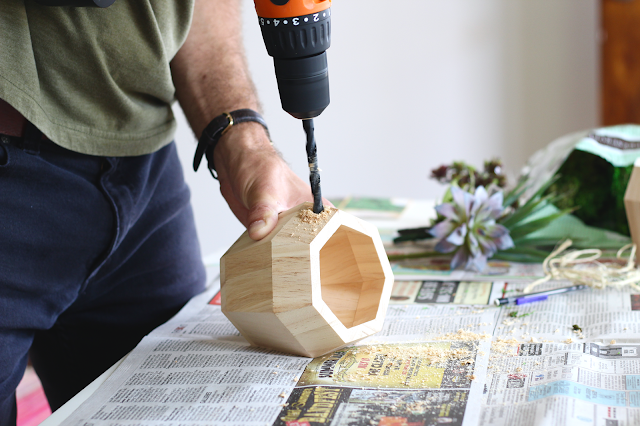 - On either side of your planters, drill a hole about 1/4 - 1/2 inch from the top rim through which you will feed the rope. - Knot one end of the rope and feed it through one side, so the knot is on the inside of the planter. 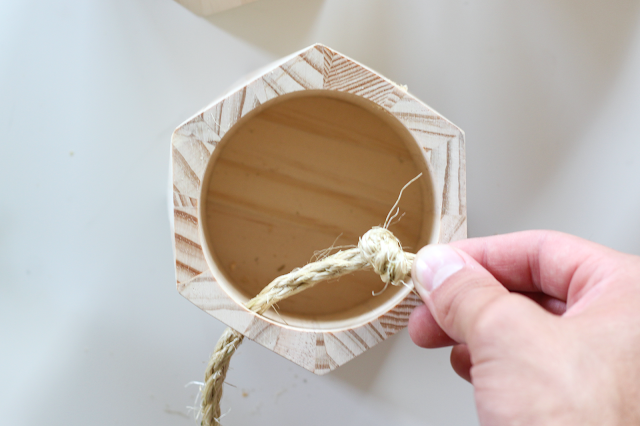 - Feed the other end of the rope through the other side of the planter, and knot again. - At the top/center of your rope, make a loop by tying a simple overhand knot. 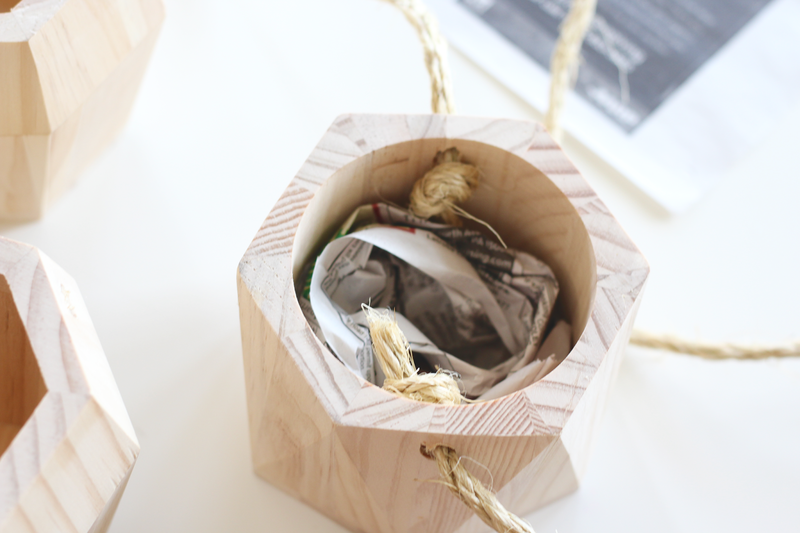 - If using faux plants, fill the majority of your planter with newspaper as filler. 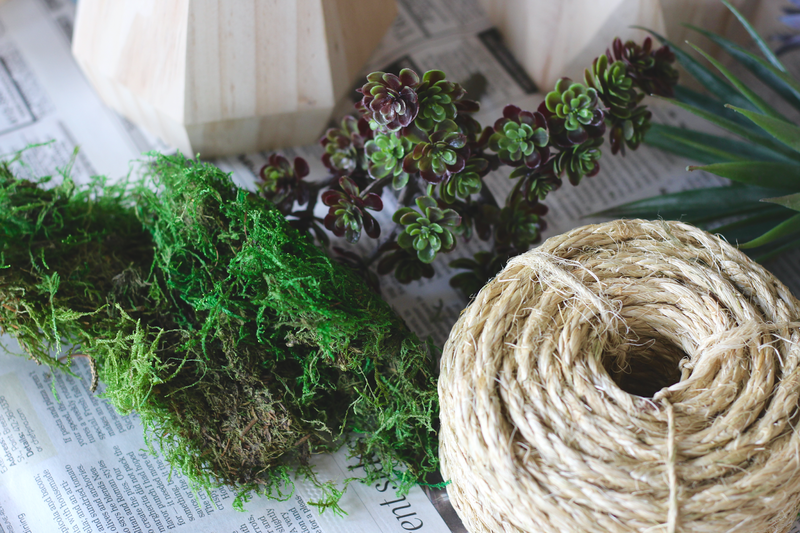 - Arrange your faux plants as desired, and top off with moss to complete the look. 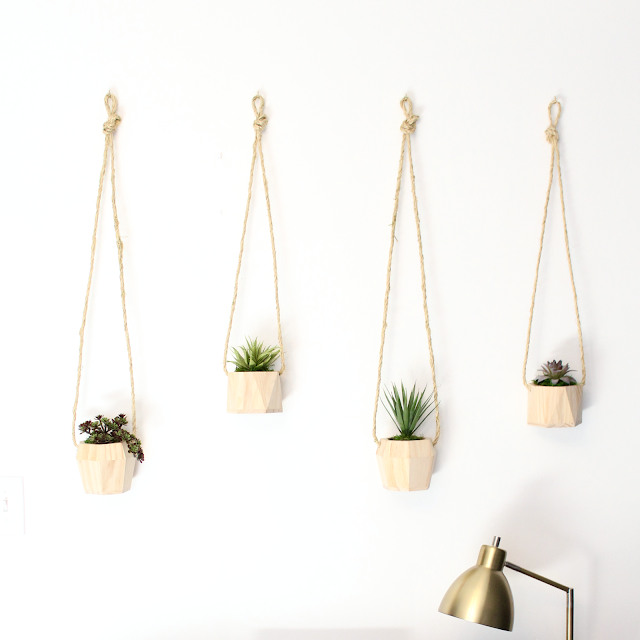 - Hang your planters from the hooks. If they seem to be hanging crooked, adjust the knot at the top to raise or lower one side of the planter. Voila! We wanted our hooks to all be level across the top, but the planters to hang at different lengths, so we used 2 different sets of measurements for our rope. I think the staggered look helps to fill up the space above the desk nicely. I'm loving the combinations of pops of green, dark blue on the walls, clean white, and that super sweet brass lamp! What do you think? We hope you like them as much as we do! We're also super excited to share a fun giveaway too! You've heard ALL about the #NSale, right? Well we teamed up with some fun bloggers to give away a $200 gift card to Nordstrom! Use the Rafflecopter form to enter daily. Giveaway ends 8/15 and is open worldwide. Winner will be notified via email. Thanks to Oh My Gosh Beck for organizing!